Death Valley is one of the most breathtaking expanses of nature in the United States. It is situated in eastern California. It is also one of the most extreme environments on earth as it is extremely hot, extreme arid and extreme mystical. Death Valley National Park covers an area of 3.4 million acres which makes it the largest national park in the United States. The highest recorded temperature in the world was recorded in Death Valley’s Furnace Creek at 134 Fahrenheit in July, 1913. It is also the driest place in the United States. It did not receive a single drop of rain in 1929. The highest elevation in Death Valley National Park is Telescope Peak at 11,049 feet. The climate of the valley is created because of the mountains on all sides which trap dry and hot air masses. According to the National Weather Service, it receives an average annual rainfall of just 2.36 inches. This valley is home to Badwater Basin which is also the lowest dry point in America, at 282 feet below sea level. This national park receives nearly a million visitors each year on average. February tends to be the wettest month in Death Valley, with an average of 0.51 inches of rain. The valley is only 76 miles from the highest point in the country, Mt. Whitney, which tops out at an elevation of 14,505 feet. The lack of water makes the valley a desert, but it is by no means devoid of life. It also has more than 600 springs. The valley received its English name in 1849 during the California Gold Rush by prospectors and others who sought to cross it on their way to the gold fields. The Amargosa river flows through Death Valley but large parts flow underground through the sandy valley. Declan, Tobin. " Fun Kids Facts About Death Valley in California ." Easy Science for Kids, Apr 2019. Web. 18 Apr 2019. 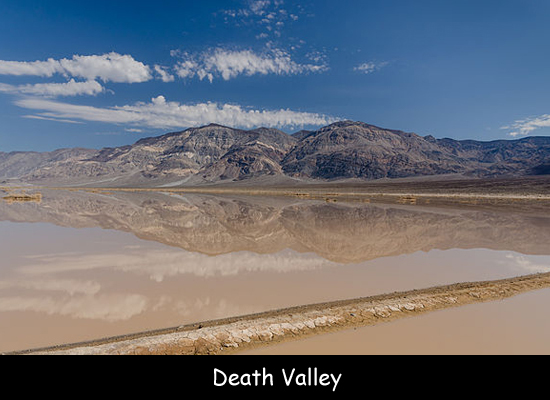 < https://easyscienceforkids.com/death-valley/ >.